This custard pie is a twist on the classic southern chess pie, it is sweetened with honey which adds great flavor! Give that southern staple a fun makeover. The custardy base is kissed with honey to give it a nice depth of flavor. 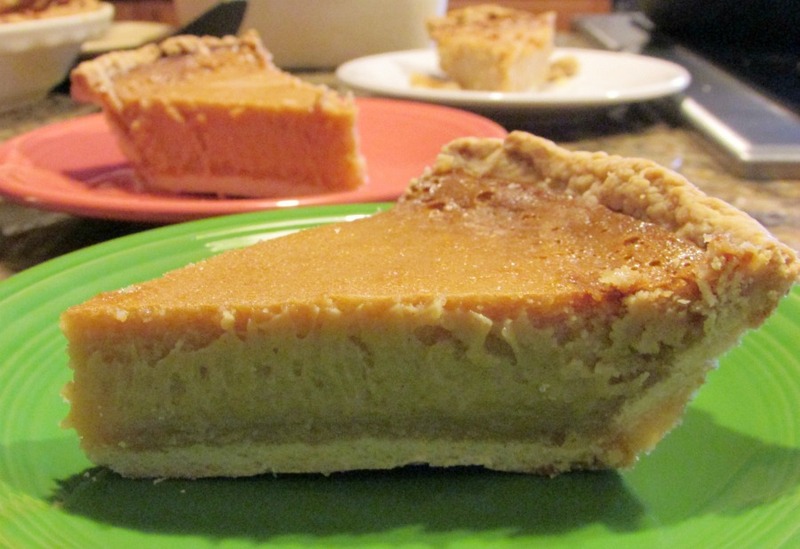 While the origins of the chess pie name are up for debate, the fact that it's good isn't. Go ahead and whip one up for dessert today! Kristie was in Nashville, Tennessee recently and was lucky enough to go to the Loveless Cafe. I asked her to bring me home their cookbooks. For our family dinner this week, I decided to make the entire meal out of those cookbooks. The recipe for this honey chess pie is in the book titled "Desserts From The Famous Loveless Cafe." I chose to use my regular flaky pie crust recipe for this. The filling is taken directly from the cookbook. Chess pies are new to us lifelong mid-westerners. Though it seems like many of the Southern cooks have a version. Being new to me, I did a little looking around to see where the chess name came from. It seems like there are a handful of opinions. The recipes go back as far as the 1700s, where there was a recipe for making cheese pie without cheese curd. Basically it describes making a custard and turning it into a pie. So that leads to the idea that chess comes from a pronunciation of cheese. Or it could be that the chess comes from chest. It is said that this pie is so sweet it can be kept in a chest rather than being refrigerated. The last idea is that chess is how somebody wrote out the pronunciation of 'jes as it in it's 'jes a pie. Who knows?! No matter where the name came from, it is a tasty pie. 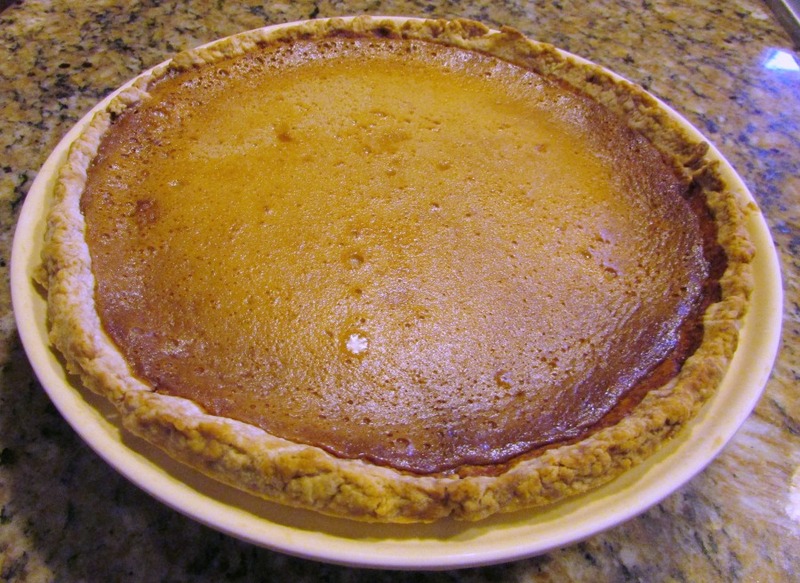 It has the same custardy texture as a pumpkin pie, but without the pumpkin or spice. Instead it has a nice honey flavor that hits you as you swallow. I have read about a lemon buttermilk chess pie... I think a bigger splash of lemon would be great with it! Maybe our next chess pie should be a honey lemon chess pie. 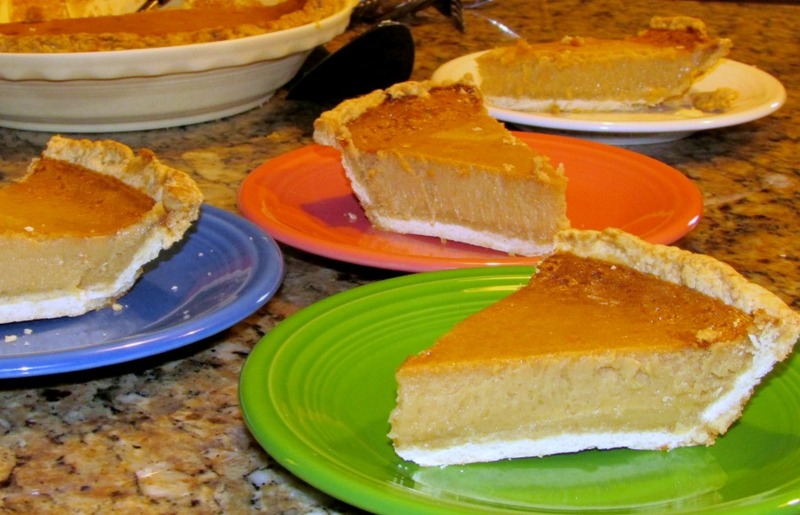 Refrigerating this pie will make it easier to cut. It tastes better at room temperature. It is suggested to chill the pie thoroughly and cut it into slices and let them stand on their plates for at least a half hour before serving. To par bake the crust: After rolling the dough and fitting it into the buttered pie pan, put it in the refrigerator for at least a half hour to chill. Preheat the oven to 375 F. Take dough out of the refrigerator and prick with a fork all over the bottom. Line the pie shell with parchment paper and fill with dry beans or pie weights. Bake for 10 minutes or until the edges start to set. Remove the parchment paper and pie weights and brush the bottom lightly with an egg white that has been lightly beaten with a pinch of salt added to prevent sogginess. Return to the oven for an additional five minutes, until the crust is lightly golden brown. Let cool before filling. To make the filling: Preheat the oven to 350 F. Place the pie shell on a baking sheet and set aside. Place the honey, brown sugar, butter, cornmeal, flour, vanilla and cinnamon in a food processor. Pulse until the mixture is smooth. With the machine running, add the eggs, one at a time, processing until blended. Scrape the bowl after each addition. With the machine one, add the lemon juice and then the heavy cream through the feed tube. Scrape the filling into the pie shell. It will be runnier than you might expect, but it will set up. Bake for about 40 minutes, or until the edges puff up slightly and the center is firm. Let cool completely before serving. Holy moley! That's a slice of delicious heart attack right there. Want! I am becoming one too! I used to really lean toward cakes, but lately I have been more into pies and cookies. This looks really good. I had never heard of chess pie but boy I think I would love it! Found you on the Tips and Tricks party! I had never tried one either before MiMi made this one and it was delicious! This looks so yummy!! I love going to amazing one-of-a-kind cafes and being able to to buy their cookbook...it makes everything inside the pages extra special, and I bet this pie is no exception! :) Pinned! I love them too! It is so much more fun than going to a chain. Plus you get the feeling that they are making their pies just the way grandma taught them! I love that you made your family dinner from the cafe's cookbook! 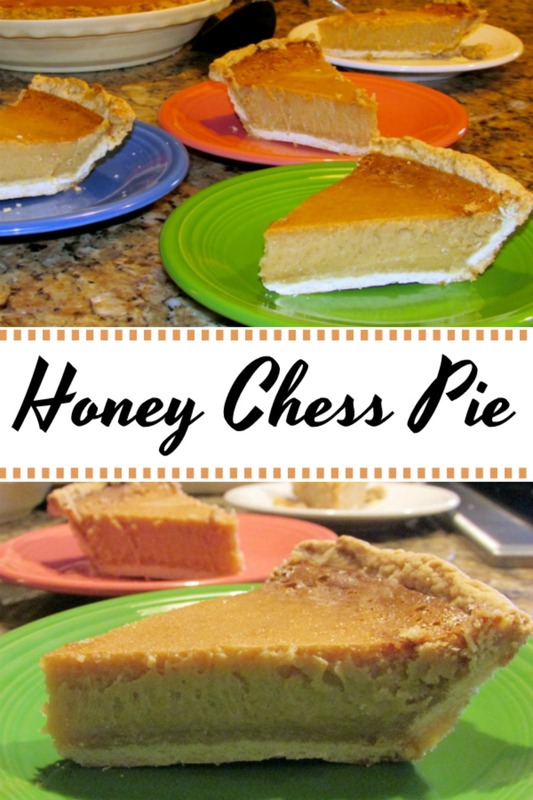 This honey chess pie, no matter where the name comes from, sounds amazing! Thanks for sharing at What'd You Do This Weekend?! It was a lot of fun and the pie was delicious! Thanks for hosting! We have really been on a pie kick around here lately! Thanks for hosting and have a great weekend! SOMEDAY I will finally break down and make a chess pie so I can taste one!! I keep hearing about them but have yet to try it myself. :) Thank you so much for linking up at Snickerdoodle Sunday- hope to see you again this weekend! That's part of the reason why we chose this recipe! We had heard of chess pies but never had one. They aren't common in our area. Thanks for hosting, see you next weekend! Chess pie - that takes me back to my childhood! I am glad we finally tried one! They aren't common in our area, but I had heard a lot about them. Yum! Thanks so much for sharing with us at #HomeMattersParty. Hope you join us again next week! The door opens Friday EST. It really was delicious! Thanks for hosting, see you next week! Hm. I always wondered why it was called a chess pie... Sounds yummy! It seems like we may never know the real answer!! This looks amazing!! Thanks for Linking up on My 2 Favorite Things on Thursday!! Hope to see you again tomorrow!! I love having You!! Pinned!! Thanks and thanks for hosting! See you tomorrow! This is a beautiful pie and I can't wait to try it. Thanks so much for sharing your post with Full Plate Thursday and have a great day! It was very tasty and fun to try something new! Thanks so much for hosting!